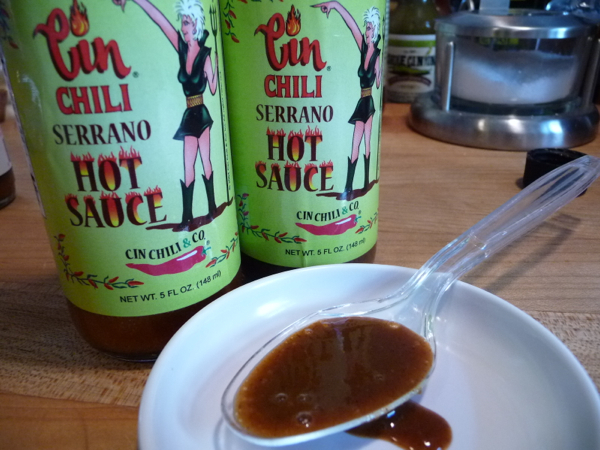 Our final review for our Week of Mild series features Cin Chili & Company’s Serrano Hot Sauce. You’ll want to have this sauce on hand for any upcoming football gatherings as it is perfect doused over your favorite bowl of chili. Just perfect. It is now our go-to hot sauce for chili – we buy it by the case. Cindy Reed Wilkins, aka The Chili Queen, is a legend in the chili community. Cindy has won an extraordinary 15 first-place awards, over 100 total, in the world of championship red chili. Her highest honor is winning the coveted Terlingua International Chili Championship not once, but twice, in 1992 and 1993. She’s the only person ever to win it back-to-back. While the serrano pepper can be quite hot, it can also be mild. Much like the jalapeños you buy in the store or grow in your garden, they vary in heat from one plant to the next. It’s kind if a crap shoot as to how mild or hot they can be. The serrano pepper is also one of my favorite chiles to use in my own homemade salsa, so I’m happy to find this mild version in the Cin Chili Serrano Hot Sauce. Cindy and Bruce Wilkins of CinChili.com have created dynamite chili seasonings and mixes, including ready-to-eat chili. Their Serrano Hot Sauce was designed to compliment a bowl of chili like no other hot sauce we’ve tried. It has just the right amount of heat, and the bright serrano chiles combined with the cumin in the sauce are a perfect companion on chili – with beans, please! Texture & Appearance: Dark rusty red with tons of flecks of spices, this is a thin sauce best poured onto food (chili!). Lightly clings to the spoon – this is not your chips and dip sauce. Taste Straight Up: First taste is vinegar and sweetness, then mild heat followed by cumin and garlic. The vinegar goes away quickly, and the heat is not overpowering. It is a decent mild heat. The cumin just makes you want a bowl of chili. Heat Level: – a delicious tingly heat, with great flavor. While mild, it rocks in flavor. The serranos will make you a convert, and the overall chili flavor will appeal to the mild or medium chili lovers out there. As for the hard-core chileheads, I’m sure you’ve already make your chili super-hot, and so this sauce will be a nice “topping” or compliment to your already hot bowl of red. Don’t forget the shredded cheddar cheese and fresh chopped onions. Label/Graphics: There’s a hot looking cartoon graphic of Cindy err, a girl in boots obviously excited to share this sauce with you. For the full backstory on the label, listen to our interview with Cindy on our HotSauceWeekly Podcast. Suffice it to say, the “hot girl” is Cindy’s trademark icon on all of her products. Overall Rating (Taste on Food, Final Thoughts): – It also rocks on omelettes and tacos. And don’t forget nachos, and Marilyn wants to try it on grilled cheese sandwiches. For the mild heat, great flavor, and perfect on chili, this sauce earns our highest award of 5 Stars. Cin Chili products rock. Give them a try. This is a mild hot sauce you must try. Visit http://cinchili.com for their Serrano Hot Sauce and all of their chili products! Tell them Brian and Marilyn from HotSauceDaily.com sent you. We did review Cindy’s Hell’s Passion Hot Sauce as a wing sauce back in 2010. Order some now, and you’ll be ready for the Football season that is just around the corner!